From Sombrerismo. Photo Susan Bestul 2018. Two big hits out of three made for a great evening. 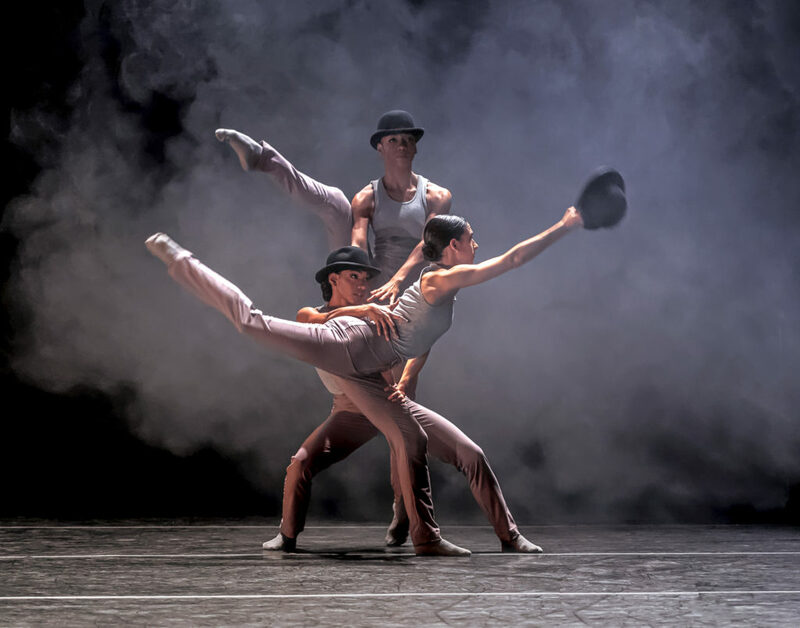 Sombrerisimo, a total delight, is choreographed by Annabelle Lopez Ochoa, inspired by the surrealist world of René Magritte who famously painted bowler hats. The work was made originally for an all-male cast; this version turns it upside down with Shelby Colona, Jenna Marie, Eila Valls, Gabrielle Sprauve, Dandara Veiga and Melissa Verdecia pulling off a bravura number. Lighting by Joshua Preston opened the piece with a big angle of shadow highlighting the women in their bowlers. It’s a zesty, humorous dance with jazz riffs, slides, and flexed feet. Maybe it was the bowlers and hip thrusts that reminded me of Bob Fosses’s Hernando’s Hideaway, although this has a distinctly Latin flavor. The six women are athletic and powerful, celebrating their culture and themselves. From the hat tossing to the section where one dancer lugs another off stage with deliberately loud grunts, they appear to be having a great time, so much so that their infectious spirit crossed the boundary to infect the audience. Bright colored jackets and the occasional shimmy added to the punch as did the downpour of bowlers at the very end. At one point the sound track intones “do what you want to do” to which the dancers seemingly respond, interpreting the steps with obvious joy. My only (minor) complaint is the music, Fantasia on a Theme by Thomas Tallis by Ralph Vaughan Williams, which didn’t work as well as it could have especially as the recording was tinny and overloud. Deep pliés figured repeatedly in “El Viaje,” a work made by Edwaard Liang having its world premiere. An examination of loss and separation, the piece shows us the pain of leaving, apparently a reference to the legacy of immigration. The tone is poignant, depicting sadness of people left behind as well as those who welcome arrivals at the other end. Lithe Melissa Verdecia, in a red dress that contrasted sharply with black/white/gray on the other dancers, was an inspiring central figure offering comfort and maybe hope. Undulating bodies and ‘star lifts’ in which the women’s arms and legs protruded in the air while supported by their partners contributed to the emotional impact. The final moment, when the group stands as a unit with faces bathed in a glow of light, was heart-rending. The best part of Homebound/Alaala was the beautiful opening—just a night sky full of twinkling lights. The rest was gimmicky and trite with disparate elements including endless rearranging of cardboard packing boxes, a frolic with paddles, a large spoon and fork and other bits that didn’t add up. Ballet Hispanico, America’s leading Latino dance organization, works to present a look into the complexity of culture. The dancers are superb, glorying in strong bodies and demonstrating robust communication with each other. The evening had no fancy sets or costumes nor does such a dynamic company need them. What it did offer was an outpouring of generous spirit and fine technique that enlivened the stage and roused the audience. March Madness, introduced by Lori Belilove sporting a glittery baseball cap and holding a basketball, presented dances from the repertoire of Isadora Duncan set to music of Schubert, Chopin, Brahms and Scriabin, played by Cameron Brant, pianist with the New York City Ballet Orchestra. Watching the earlier dances of the program felt like seeing figures on a vase come to life, perhaps what Duncan would have wanted. The choreography was repetitive with lots of turns in attitude and skipping, the dancers in flowing, pale costumes banded under the breasts in the Greek style. In between dances which were grouped as to composer, Belilove read a few Duncan quotes, the most memorable being “You were once wild here. Don’t let them tame you.” She brought out some of the dancers to demonstrate basic Duncan technique that involves feeling the breath and using the entire body with references to Dionysus, the God of Ecstasy. Becky Allen gave the evening a lift, dancing to Chopin’s Minute Waltz with twinkling feet and beautiful arms. All the dancers are supple and sinuous in presentation, a delicate-seeming condition that overlays nerves and muscles of steel. It’s harder than it looks. Caroline Yamada, one of the smaller women in the company, has an arresting presence that made me want to focus on her when she was onstage—good for her, not so much for her colleagues. Death and the Maiden, a reference to Ariel Dorfman’s play about fear, secret terror and women’s oppression, was powerful—less artful skipping and more emotion. Belilove danced the two pieces set to Scriabin, Mother and Revolutionary both choreographed in 1923. Scriabin’s music was a major contrast to the pretty tunes of the other composers with more power and less delightful charm. Mother is said to be a lament for Duncan’s own children, tragically drowned when the car they were in rolled into the Seine River. The work is simple and eloquent as Belilove moved across the state in a diagonal line to end on the floor, palms outstretched in anguish. In Revolutionary, she struck a strong political note, clenching her fists to demand a fight for freedom, clad in a simple and very effective red dress. Lori Belilove & The Isadora Duncan Dance Company is the performing troupe of the Isadora Duncan Dance Foundation. Under Belilove’s direction, the group performs over 80 authentic dances that highlight the unique qualities of Isadora Duncan’s repertoire, from the early lyrical pieces to the tragic solos. Each member of the all-women company has received private coaching from noted Duncan authorities. As a creative team, the troupe continually explores ways to deliver the essence of Duncan into the 21st Century. From “Three to One”: Byron Tittle, Michelle Dorrance and Matthew West in Three to One. The program opened with Jungle Blues. Set to music of “Jelly Roll” Morton, the dancers rolled their hips and knees and landed some deliberately awkward, humorous moves. There were twists and turns as well as one-footed slides ending with a balance on the toes. The dancers moved together and broke off into unexpected, improvisational solos and duets, tapping chops on full display. The piece has no obvious setting but evokes a sense of being at a southern bar or club on a warm evening, a perception enhanced towards the end when a dancer produced a flask to swill from. Funky and fun, it left me wanting more. Dancers Elizabeth Burke, Warren Craft, Luke Hickey and Byron Tittle shared the stage with four basses (two handheld, two large) played by Kate Davis, Michelle Dorrance, Donovan Dorrance (Michelle’s brother) and Gregory Richardson in Basses Loaded. The dancers, in sporty, casual clothes of muted corals and browns effectively designed by Andrew Jordan, each had a long, energetic solo, all dynamite especially Elizabeth Burke’s. Moving against and with the dancers, the musicians made their own patterns spatially and musically, sometimes pushing the big basses across the floor in synchronization, sometimes at odds with the dancers’ movements. While every one of these artists is a proficient multitasker and each seems to enjoy the others’ contributions, the work was shapeless and too long. Unfortunately, overkill was my major takeaway from SOUNDspace, which came to an end several times only to begin again as though a new inspiration couldn’t be omitted. Even Dorrance’s masterly solo was too much of a good thing. The company tapped on raised, large boxes; tapped on the floor; made percussive sounds with body slaps; snapped their fingers, vocalized—it was the kitchen sink of tap including a final coda that tossed in a little break dancing. One dazzling element followed another to the point of exhaustion—mine and perhaps also the performers. This work, effective parts and all, would benefit from some editing and a clearer focus. In the world of tap Michelle Dorrance is an innovator bar none. A splendid choreographer and charismatic dancer, she shows her enthusiasm for the sounds and movements taking place around her. Tap as created by her and her company moves the genre into exciting new directions that elicited frequent whoops of pleasure from the audience. When Dorrance reins in her desire to throw everything possible into the mix, she nails it. Dorrance Dance won a Bessie Award, (saluting outstanding and groundbreaking creative work by independent dance artists in NYC), for its inaugural performance which was cited as “blowing open our notions of tap.” The company continues to expand audiences for this very American art form. Mari S. Gold is a freelance writer who contributes to many magazines and websites. Her blog, But I Digress… , on cultural events, travel, food and other topics is at www.marigoldonline.net. She lives in New York City.